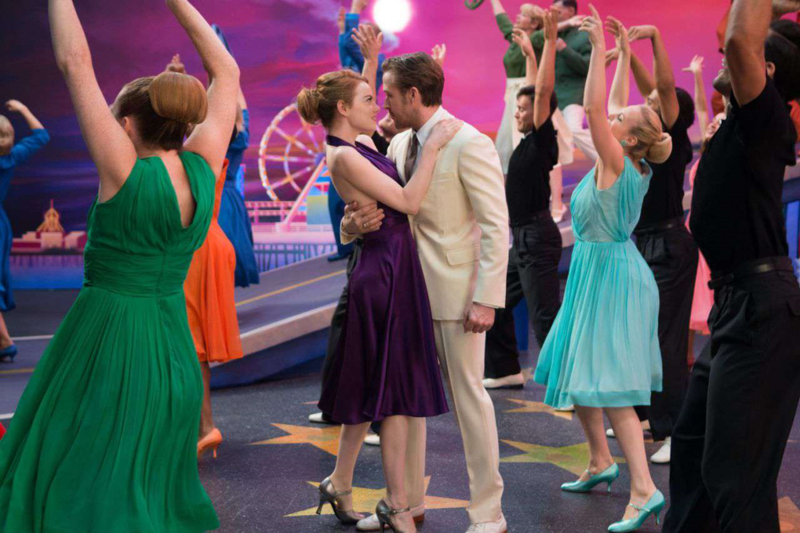 When the director of La La Land, Damien Chazelle, was asked why he put a dream ballet at the end of the picture, he responded, “Why wouldn’t you put a dream ballet at the end of the picture?” La La Land tells the story of lovers Mia and Sebastian—she’s an aspiring actress and he’s a struggling musician—from the inception of their relationship to its unraveling. When they spot each other five years after breakup, the dream ballet takes them to an alternate universe where each makes different decisions that result in a thriving long-term bond, all set to music and dance. I took great satisfaction from his answer about the dream ballet because he delivered it with equal parts incredulity and disdain; it felt right, so he did it. He’s a creative; he followed his instincts and created. He’s also a student of film history and knew from pictures going all the way back to silents that alternate-universe endings can slay an audience. Emma Stone and Ryan Gosling in the dream ballet. I’m in awe of creativity like what Damien Chazelle did with La La Land because it’s magical and I don’t know where it comes from, in anybody. From nothing comes something, a painting, a film, a book, a song, a performance with the power to entertain or even change lives. It all begins with an inspiration, a vision of art that needs to be created. I didn’t have an outline, just a vision that the story must open with a plane flying over Las Vegas in the night. To breathe life into an old headline, I went by instinct, and instinct told me to do it this way and for better or worse, I did. Over and over I saw it and heard it, that plane flying over in the blackness of a Vegas night sky, its motors droning on into the distance. I also knew where Mission would start, with a man (it’s Jimmy Stewart but he isn’t names in the prologue) plagued by PTSD from the war standing in a town covered in fake snow in the Mojave Desert in a heat wave, about to shoot a scene where he goes around shouting “Merry Christmas!” when it was really June. To me it had to start there, in the land of make-believe—the last time Jimmy Stewart had seen snow, it was while he was risking life or death on a rough bombing mission against Nuremberg and could see the Alps off to his south. Now he was back in Hollywood, and what must that have been like for a soldier who had seen too much action? While in the Netherlands researching Mission, I discovered the city of Arnhem and learned that Audrey Hepburn had spent the war there. So began the journey as I tried to research Audrey’s life in Arnhem and came up with surprisingly little. I looked at all the biographies and each had, at most, a chapter about the war. A chapter! About the war! It was Jimmy Stewart all over again because that’s what I had found with Jim—biographers would basically say, “So Jim went off to war.” And the next sentence would be, “When he came back…” WHAT? Because of a number of factors—key Dutch people willing to help and key archives I could access—I decided to go for it and write a book about Audrey in the war, which became Dutch Girl: Audrey Hepburn and World War II, to be released in the U.S. on April 15. Embarking on the project, I faced the same challenge I had with Jim, who refused to go on the record about certain aspects of the war. Audrey was another very private person and there were episodes she would discuss, and many she would not. However, this time I had about 6,000 of Audrey’s own words about the war to go on, which was about 5,800 more than I had from Jim, so that was a start. But how do you structure a narrative about Audrey in the war? 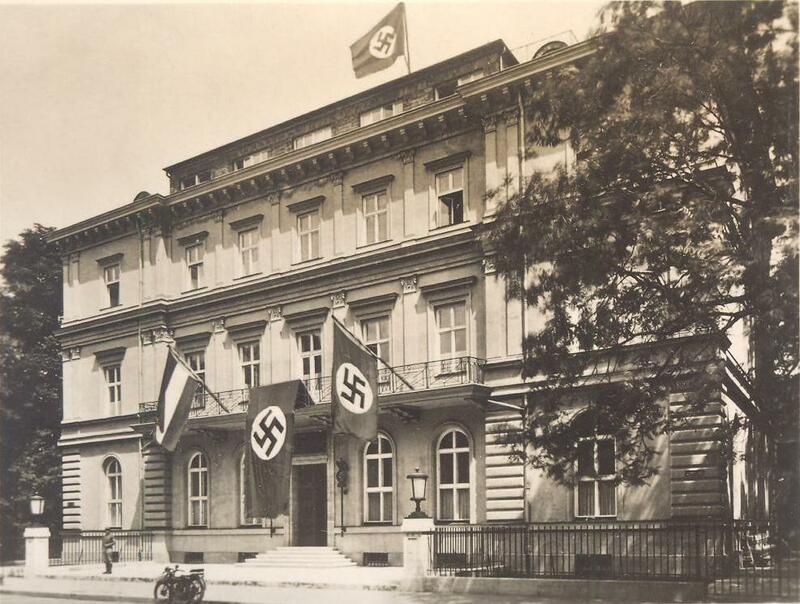 All I knew was that once again I had a starting point, a scene that had to begin the book: In the spring of 1935, Audrey’s mother met Adolf Hitler in Munich. Hitler was then the name on lips worldwide, a vibrant and charismatic superstar who had brought pride and prosperity back to a Depression-plagued Germany that had recently lost the Great War. This time around, the reader begins in Hitler’s office and looks into his blue eyes and shakes his hand, all the while wondering, on page one, where in the world is this going? 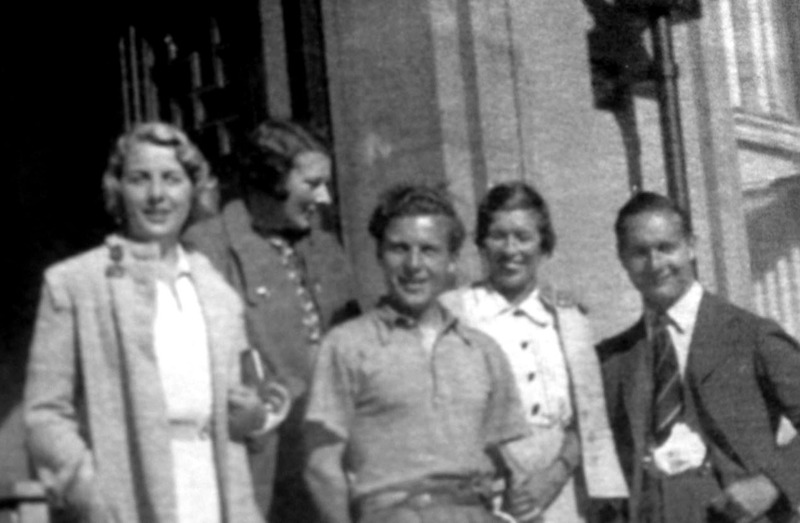 Pamela Mitford, Ella van Heemstra, Michael Burn, J.C. Hills, and Coleridge Hills stand on the steps of the Braunes Haus in Munich the day the group met Adolf Hitler, who was then a friend of Pamela’s sister Unity Mitford. It was such a memorable occasion that Ella kept this photo framed in the Arnhem apartment where Audrey spent the first two years of German occupation. Well, I promise, not where you’d expect. There are two main characters to drive the narrative this time, Audrey, who enters adolescence under Nazi occupation in Arnhem, and Ella, Audrey’s mother, the Dutch baroness who had been enamored of Hitler. The twist is that occasionally we flash forward to see Audrey at different points of her adulthood, being who she became because of the war and living with the pain of all that had happened. There’s also a lot of history in this book, about the war, the Nazis, the Dutch Resistance—some joker on Goodreads already slammed the advance reading copy for too much history. “Cut it by a third; lose the history,” this person said. 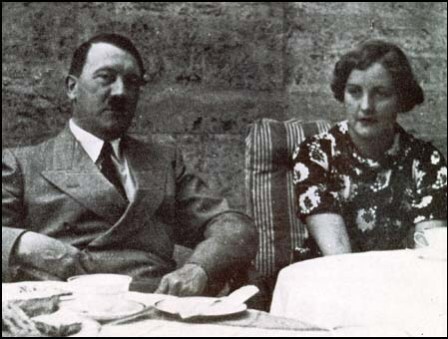 Unity Mitford sits with Hitler in Munich. A rebellious young British aristocrat, she was an avid Hitler groupie and jealous of Ella and anyone else who threatened to horn in on ‘her man.’ Supposedly a souvenir photo of Ella with Hitler was taken the day of their meeting, but it’s been lost to posterity. A long shot of the Nazi Party’s Munich bastion, the Braunes Haus, which was destroyed by U.S. and British bombs during the war. Thank you, Sarah. I’m relieved to know it’s not just me who was moved by this picture. I haven’t seen “LaLa Land” yet, but will do so at some point. I understand it was inspired by old Hollywood musicals and by “The Umbrellas of Cherbourg” which was also inspired by old Hollywood musicals, minus the happy ending. But I digress. I look forward to reading your new book, “Dutch Girl.” I like history, and I don’t mind reading it in the context of a biography in order to better understand a story. Michener usually spent the first few chapters of each of his novels with a history lesson, and a wonderful work of nonfiction I recently read called “The Children’s Blizzard” was threaded with a lot of historic facts and figures throughout the narrative, which helped me to understand and ‘live’ the story better in my mind. Your comments about women falling under the spell of Hitler didn’t surprise me, because I’ve heard it before. I knew a woman, now deceased, who immigrated here from Germany and who had spent her childhood years in Germany both before and during WW2. We were discussing history, and when I asked her for her opinion about Hitler, she did shock me by defending him and his actions, by saying that he wasn’t responsible for the evil actions perpetrated on other humans, that it was “his cronies” who committed those acts and not him, and that she had loved him as did many Germans. Now that did shock me, because I’d expected her to denounce him! Thank you for another interesting piece, Robert! Well, Bonnie, your friend grew up from the time she could talk listening to propaganda about the great, kind, and wonderful Führer. She sang songs to him and sent him birthday cards, as did all good German children. Through the entirety of the war many if not most Germans expected the Führer to save them from destruction without understanding that he was the cause of it all. How could he be? He was their savior! It’s too easy to look at 1935 Germany from a 2019 perspective and denounce anyone who had anything to do with Hitler back then. But as late as 1938 Churchill was singing Hitler’s praises, as were many other world leaders. In terms of Dutch Girl, Audrey’s mother is a complex character who has been, I assert, misinterpreted by history. I can only hope I’ve done her justice. Thank you for wanting to read the book, Bonnie. I appreciate it and look forward to your reaction. “Cut it by a third; lose the history” – FFS, the historical perspective we gain by wrapping our brains around the events of the past is what helps us identify when we are on the brink of a threat or on the path of a successful venture. It doesn’t matter if we gather this perspective from a biography or a textbook. What I hope is that it will spur someone on to want to learn more. I should think Audrey Hepburn, who could not speak publicly about the history she lived, would be relieved that her story was told in detail and from all angles in hopes that it will make a difference. As you probably know by now, René, I love history and think it has everything to teach us. Thank you for your comment, your understanding, and your support.